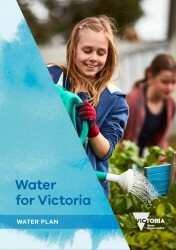 The Department of Environment, Land, Water and Planning (DELWP) has been working hard to prepare for the Integrated Water Management Forums described in the Draft Integrated Water Management Framework for Victoria released last year. The Forums will provide a space for discussion between water sector organisations with a view to developing collaborative place-based water cycle opportunities. The IWM Branch at DELWP is now pleased to announce Dr Shiroma Maheepala, Dennis Corbett and Katie Burns as project managers to facilitate the upcoming metropolitan IWM forums. Project managers will be contacting stakeholders over the coming months to discuss the forums and IWM in your organisations. Elliot Stewart will be leading facilitation for regional councils, CMAs and water corporations and will also be reaching out to stakeholders over the next year. The team look forward to speaking with a range of officers, managers and executives from your organisations to understand water cycle issues and opportunities.